First Responder UAVs Are Finally Getting Serious. Law enforcers and other First Responders have a very poor track record with ‘drones’ or Unmanned Aerial Vehicles (UAVs). They proved as likely to recover insurance money after a crash as to recover a lost citizen. With so much hype and promise, why have UAVs for First Responders worked out so poorly? One fundamental reason is that First Responders believed the sales hype and bought whatever toy, radio controlled, hobby drone the industry would paint in their colors. Two thousand dollar RC helicopters became $150,000 ‘systems’. Quad, hex and octo rotors became the flavors of the day. Then reality arrived in the form of weather, darkness, airspace rules and a pair of officers sidelined to struggle with each toy. The airspace bureaucracy is very slow: The FAA is not sure how to deal with this new phenomenon (other than to try to restrict their operation as much as possible). Almost daily news of civilian quadcopters flying illegally near commercial airlines, interfering with firefighting efforts and invading privacy harm First Responder efforts to do it right. No wonder that the public is very suspicious of unmanned systems for First Responders. 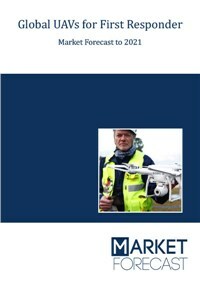 This is why Market Forecast created an all-you-need-to-know UAVs for First Responders report – a single publication that combines a Market and Technology Forecast with an Operating Concept and a Buying Guide. System designers, vendors, policy makers and operators will benefit from the comprehensive markets and technologies analysis. First Responders need the Buying Guide to avoid the very costly mistakes some of their predecessors made, plus the terminal mistake of copying military methods. Both groups need the detailed Operating Concept because, without a proper Operating Concept, there is no way to successfully procure, integrate, train for and operate this new generation of autonomous aircraft. Timely Business Opportunities – specific details on what First Responders need and how to sell to them in a way that generates profitable word of mouth sales. Reasoned Market Forecasts – fact-based, scenario-driven tables and charts over multiple technologies and regions. Reasoned Technology Forecasts – only the relevant systems with clear explanations of the differences with the UAVs seen in todays press. Education – both First Responders and sellers will learn the best ways to develop these new capabilities while avoiding the political problems. Detailed Drivers and Inhibitors – what will help the markets and what will hurt them. Readers, particularly homeland security professionals, will be better prepared to use future capabilities, better equipped to compete for those sales and well prepared for the coming changes.